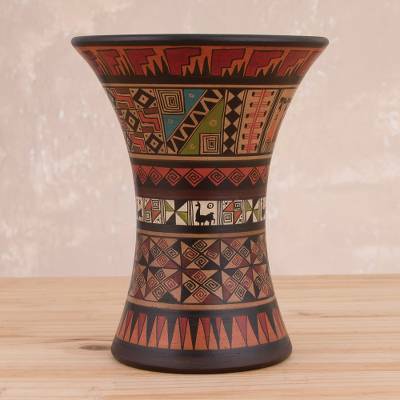 Cultural Inca-Style Ceramic Decorative Vase from Peru, "Ceremonial Kero"
In ancient Inca cultures, the kero was a vessel used to drink alcoholic drinks, such as chicha, a type of corn beer. The Huaman Paucar Family of Peru offer this ceramic decorative vase, bringing a touch of pre-Hispanic culture to your home. It is hand-painted with intricate, polychromatic geometric motifs characteristic of the era. 16 cm H x 13.5 cm Diam. 6.25" H x 5.25" Diam. Huaman Paucar Family has received 7 microcredit loans with 0% interest from Kiva and Novica, the first for $900 and the most recent for $400. Proceeds were used to invest in the materials they use so that they can increase pottery production.